Chest discomfort.Most heart attacks involve discomfort in the center of the chest that lasts more than a few minutes, or that goes away and comes back. It can feel like uncomfortable pressure, squeezing, fullness or pain. Discomfort in other areas of the upper body.Symptoms can include pain or discomfort in one or both arms, the back, neck, jaw or stomach. Shortness of breathwith or without chest discomfort. Other signsmay include breaking out in a cold sweat, nausea or lightheadedness. 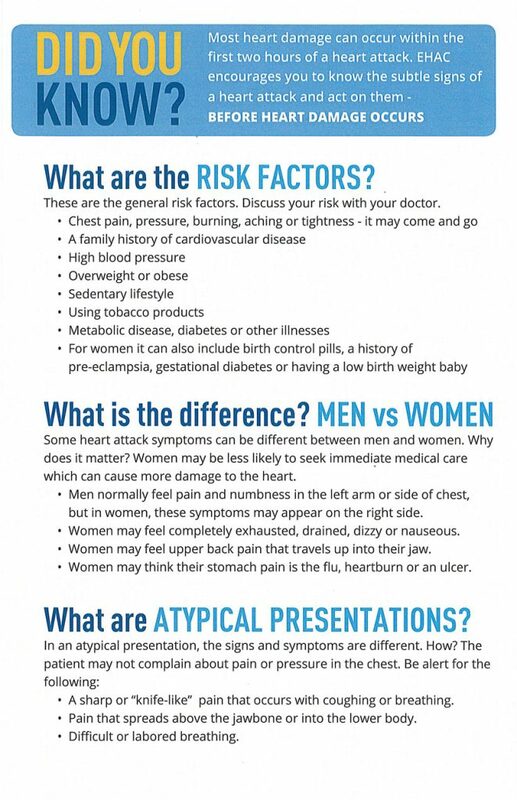 As with men, women’s most common heart attack symptom is chest painor But women are somewhat more likely than men to experience some of the other common symptoms, particularly shortness of breath, nausea/vomiting and back or jaw pain. 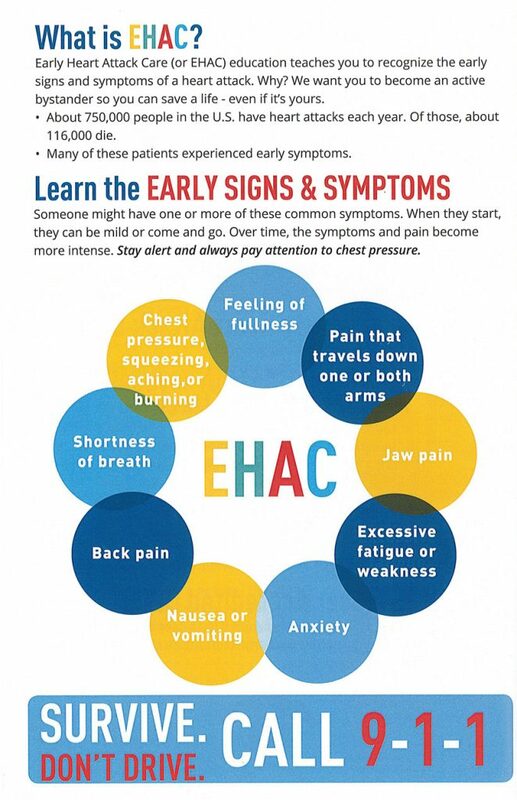 Learn the signs, but remember this: Even if you’re not sure it’s a heart attack, have it checked out. Minutes matter! 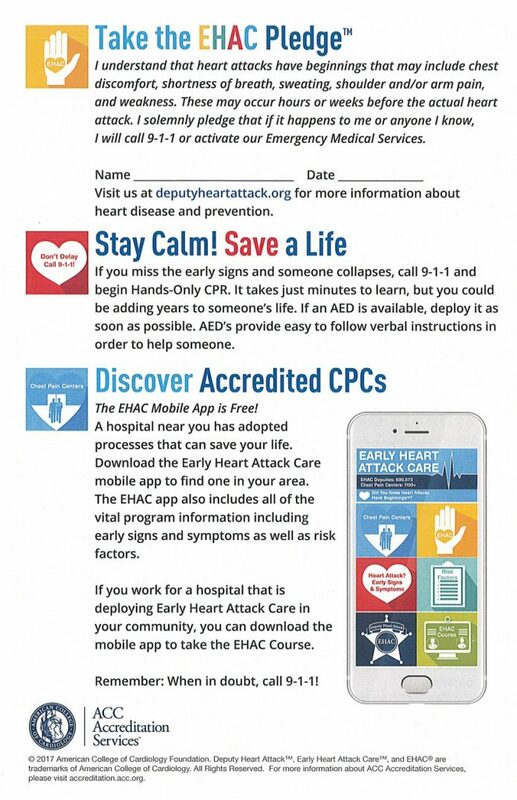 Fast action can save lives — maybe your own. Don’t wait – call 911 or your emergency response number. Calling 911 is almost always the fastest way to get lifesaving treatment. Emergency medical services (EMS) staff can begin treatment when they arrive — up to an hour sooner than if someone gets to the hospital by car. EMS staff are also trained to revive someone whose heart has stopped. 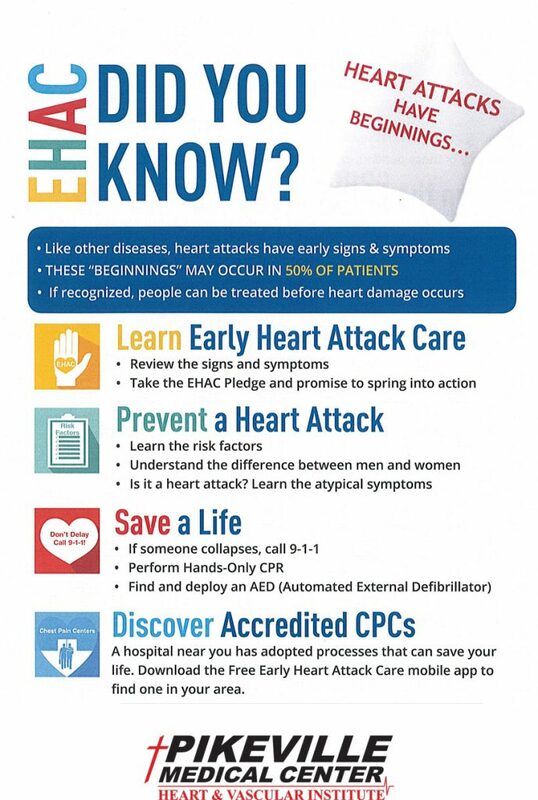 Patients with chest pain who arrive by ambulance usually receive faster treatment at the hospital, too. It is best to call EMS for rapid transport to the emergency room. If you are on an eating plan that limits sodium, choose foods with less than 300 mg of sodium per serving. Choose foods with very little or no saturated fat or trans fat. Remember: Not everything that is advertised or labeled as healthy is really good for you! Start with fresh fruits and vegetables. These do not have added fats, sugar, or sodium. Look for types that do not have anything added to the fruits or vegetables, such as sauces, gravies, or seasonings. Canned vegetables may be high in sodium. However, you can enjoy many lower-sodium or salt-free varieties. Look for products with whole grains (such as whole wheat, rye, or oats) as the first ingredient. Breads with at least 2 grams (g) of fiber per serving are good choices. Select cereals that contain at least 5g fiber per serving. Limit cereals that list added sugars on the label. Check the label for the amount of sodium if you are on a reduced-sodium plan. Choose nonfat (skim), ½%-fat, or 1%-fat milk. Look for tasty cheeses that are low in saturated fat and sodium. Choose them more often than regular cheese. You can get protein from poultry, fish, beef, pork, dried beans, soy products, and other vegetable proteins. When choosing beef and veal, pick cuts without much marbling (fat). Healthy types include round steak, tenderloin, and sirloin tips. Lean center cuts are the best cuts of pork and lamb. You can buy any type of fresh fish that you enjoy. Do not always choose the same kind because some types may contain mercury or other contaminants that you don’t want to eat in large amounts. Canned fish (such as tuna) can be high in sodium. Choose low-sodium brands. Add vegetarian entrees and vegetable protein foods, like beans, veggie burgers, or tofu. Look for products that are low in saturated fat and sodium and high in fiber. Convenience foods, such as canned soups, pasta sauces, and prepackaged or frozen dinner entrees and side dishes can be high in sodium and/or fat. Read labels and choose carefully. Nuts, seeds, and pretzels make good snacks. Avoid those with added salt. Keep your sodium and saturated fat limits in mind while you shop. Fresh fruit and nonfat or low-fat frozen yogurt are good choices. There are many kinds of reduced-fat and fat-free candies, cakes, cookies, pastries, and frozen desserts. They may fit within your limits for fat and sodium. However, many fat-free or low-fat desserts are high in calories and low in healthy nutrients. Have them only occasionally.